Introduction: Physiologically, the individuals exposed to the noise may develop a very common pathology; the occupational noise induced hearing loss. Objective: Research the by means of a cross-sectional study, prevalence of occupational hearing loss in workers exposed to noise pressure levels over 85 dB NPL. Method: 400 records of workers exposed to noise pressure levels above 85 db NPS, working in companies of different segments. Results: In this sample, statistically significant differences were observed between the low and high frequencies thresholds and that the work duration influenced in the worsening of high frequencies thresholds bilaterally. As for the laterality no significant differences were confirmed between the ears, as well as the absence of correlation between tinnitus and hearing loss. Conclusion: An intensive work of auditory health promotion and/or auditory loss prevention must be emphasized, especially for workers exposed to high level occupational noises, as well as the appropriate features of individual auditory protection equipment. The hearing health conditions in the work environment has been object of many studies in the public health field, since the exposure to high levels of noise may provoke irreversible damages to hearing as the Hearing Loss Induced by High Sound Pressure Levels (PAINPS). In addition to the hearing function change due to exposure to occupational noise, the noise and PAINPS commit the workers' communication and quality of life. The noise is considered to be the most frequent physical agent harmful to the health in the working environment, and is characterized as the factor of most prevalence for the origins of occupational diseases (Padovani, Nova, Queirós, Silva, 2004) (1). The PAINPS, in turn, is the second strongest cause of man hearing loss, in addition to being the most frequent occupational disease (Manubens, 2001) (2). According to the Ministry of Work (article 168 of Consolidation of Work Laws (CLT), in NR 7) (3) and Decree SSST/MTb no. 5, published on February 25th, 1997 (4), minimal guidelines and parameters were set forth for the hearing evaluation and follow-up of workers exposed to high noise pressure levels. They defined the PAINPS as a hearing loss generated by high sound pressure levels, with alterations of the auditory thresholds, of neurosensorial type, resulting from occupational noise exposure, and presented irreversibility and gradual progression with duration of risk exposure as main features. Gatto, Lerman, Teixeira, Magni, Morata (2005) (5) defined the PAINPS as a cumulative and insidious pathology, that progresses along the years of exposure to the noise associated to the working environment. The PAINPS initial signals show the affection of the auditory thresholds in one or more frequencies between the ranges from 3000 to 6000 Hz. According to Hanger, Barbosa-Branco (2004) (6) the highest and lowest frequencies may take longer to be affected. Some studies verified that the frequency of 6000 Hz is the most affected in the PAINPS suggestive audiometries (Ruggieri, Cattan, Giardini, Oliveira, 1991 (7); Correa Filho, Costa, Hoehne, Perez, 2002) (8), whereas other studies reported the frequency of 4000 Hz is more affected in the initial stages (Kós e Kós, 1998 (9); Araújo, 2002 (10)). In addition to the hearing loss, tinnitus is a common complaint of professionals that work in noisy places, with levels of 85 dB NPS or higher, and is present in 4% of the cases examined in the work of Araújo (2002) (10). Dias, Cordeiro, Corrente, Gonçalves (2006) (11) inquired the association of PAINPS with tinnitus in 284 workers and confirmed the tinnitus prevalence increases according to the auditory damage evolution. The prevalence of PAINPS in the Brazilian industries described in the literature is high. Carcinelli (1988) (12) verified that 32.7% of 150 workers studied presented with a suggestive picture of PAINPS. In the hearing longitudinal study of 80 metallurgic workers during three years, Fiorini (1994) (13) verified a final prevalence of 63.75% of PAINPS and along those three years, 23.75% acquired PAINPS. Since PAINPS is a disease susceptible to prevention and its prevalence is still high in the working place, and this hearing loss may damage the quality of life, by affecting the social relationships, communication and work, the importance of preventive and collective actions aiming at the hearing and general health conservation is evident. Therefore, the objective of this work is to inquire, by means of a cross-sectional study, the prevalence of occupational hearing loss prevalence in workers exposed to sound pressure levels above 85 dB NPS. In this work, 400 workers reports were included, and these wore 372 men and 28 women, working in different segments companies, amongst whom, chainsaw operator, tractor operator, machine operator, mechanic, welder, driver, mechanic, power pump operator, general services, forest machine operator, heaterman, package assistant, electrician. All working places presented sound pressure levels equal or higher than 85 dB NPS. We observed data from the specific interview and Threshold Tonal Audiometry, carried out by means of the Beta Medical audiometer, model CDA 3000, with auricular phones TDH-39P, calibrated according to the norms of audiometer benchmarking and INMETRO. The exams were performed in the Vibrasom acoustic cabin. The audiometries were classified according to Fiorini's proposal (1994) (12), in 3 groups, Group I, audiograms suggesting normal hearing; Group II, audiograms suggesting PAINPS, and Group III, audiograms with other classifications. The values observed in the variables studied were filed in Microsoft Excel. We used descriptive statistics by means of averages, medium, minimum and maximum values. In order to analyze the difference between averages, we used the t-paired test. A Spearman correlation coefficient was used in order to verify the correlation between variables of occupational noise exposure time and auditory thresholds. In all statistical tests we adopted the significance level of 5% (p < 0.05). From the statistical analysis we could draw the audiologic profile of the studied population. We will first present the data obtained as for the hearing loss classification. Out of the 400 records analyzed, 287 (71.75%) presented normal audiometric exam in the right ear and 278 (69.50%) in the left ear; 107 (26.75) presented with neurosensorial hearing loss in the right ear and 115 (28.75%) in the left ear; 4 (1%) presented with mixed hearing loss in the right ear and 4 (1%) in the left ear; in 2 (0.05%) cases we observed conductive hearing loss in the right ear and in 3 cases (0.75%) in the left ear. Such information may be viewed in Table 1. As we may see in Table 1, the hearing loss, irrespectively of the type, was observed with a higher prevalence in the left ear (30.5%), while in the right ear we observed a prevalence of 28.25%. 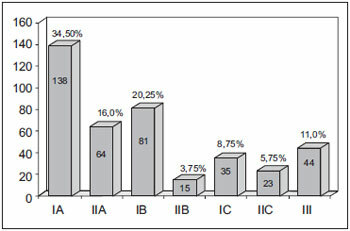 According to the Classification proposed by Fiorini (1994) (12), 138 (34%) workers presented normal bilateral hearing (IA); 81 workers (20.25%) presented with normal hearing with unilateral incision (IB), 35 workers (8.75%) had normal hearing with bilateral incision (IC), characterizing Group I. In Group II, 64 workers (16%) had bilateral PAINPS suggestive hearing (IIA), 15 workers (3.75%) presented with unilateral PAINPS suggestive hearing loss (IIB), 23 (5.75%) presented unilateral PAINPS suggestive hearing loss with opposite ear incision (IIC), and in Group III, 44 workers (11%) had audiometries that didn't fit in the normal hearing classification nor in the PAINPS group features. This data may be observed in Graphic 1. Graphic 1. Classification of audiometries according to Fiorini's proposal - IA-bilateral normal hearing IIA-present bilateral PAINPS suggestive hearing IB-normal hearing with unilateral incision IIB-unilateral PAINPS suggestive hearing loss IC-normal hearing with bilateral incision IIC-unilateral PAINPS suggestive hearing loss with opposite ear incision III-audiometries that didn't match the normal hearing classification nor the PAINPS group features. Table 2 describes average, medial, minimum and maximum values of the right and left ears audiometric thresholds. In this Table it was possible to confirm that frequencies of 3000, 4000 and 6000 Hz of both ears presented more affected thresholds, and the most affected frequency was that of 4000 Hz. The comparison between the right and left ears auditory thresholds averages, carried out by means of the t-paired test, didn't show there are statistical significant differences for the high-frequencies (p = 0.120) nor for low-frequencies (p = 0.249). However, in the comparative analysis between high and low frequencies, also accomplished by means of the t-paired test, it presented a statistically significant difference for both ears (p< 0.001). As for the tinnitus prevalence in the cases studied, we confirmed only 11 (2.75%) workers presented with tinnitus complaint. In order to verify if the occupational noise exposure time influenced the auditory thresholds, we carried out the Spearman correlation coefficient test. Then, we carried out a division of workers into groups according to the exposure period. Therefore, group I was composed by workers with working time lower than 2 years; group II, from 2 to 5 years; group III, from 5 to 10 years and group IV with over 10 years of work, as described in Table 3. Before the results mentioned above (Table 3), we may observe a statistically significant correlation between the time of exposure to occupational noise and the auditory thresholds for both ears, as well as the comparison between the high and low frequencies averages, and such correlation was stronger in the high frequencies. As for the profile of the audiometries studied in this work, we confirmed that in 400 participants, 138 (34.5%) audiometries were within the normal standards, whereas 262 (65.5%) had altered thresholds, that is, below 25 dB NA (Padovani, Nova, Queirós, Silva, 2004 (1); Manubens, 2001 (2)). The audiometries were also analyzed by ears, and they formed 800 ears analyzed, out of which, 287 (71.75%) presented with auditory thresholds within the normal standards for the right ear and 278 (69.50%) for the left ear. From all cases, we verified that 107 (26.75%) right ears and 115 (28.75%) left ears presented with neurosensorial hearing loss, followed of 1% of the right ear and 1% of the left ears with mixed hearing loss, and conductive loss in 0.75% in the right ear and 0.5% in the left ear (Table 1). Such findings confirmed the prevalence of neurosensorial hearing loss in workers exposed to occupational noise, as well as the alteration bilaterality, findings that confirm the description of PAINPS proposed by NR 7 (3) and Decree SSTM/Mtb of 1997 (4). By means of the data presented in Chart 1, according to the classification proposed by Fiorini (1994) (12) 20,25% of the audiometries analyzed presented thresholds of up to 25 dB NA with unilateral incision and 8.75% with bilateral incision in the frequencies of 3000, 4000 or 6000 Hz. The studies presented in the literature mention that PAINPS starts in the frequency range between 3000 and 6000 Hz , (Hanger, Barbosa-Branco, 2004) (6) and the frequency of 6000 Hz is the most affected (Ruggieri,Cattan Giardini, Oliveira, 1991 (7); Corrêa Filho, Costa, Hoehne, Pérez, Nascimento, 2002 (8)), however, other works report the frequency of 4000 Hz is the most committed in the initial stages (Kos e Kos, 1998 (8); Araújo, 2002 (9)). Therefore, it's confirmed that this group requires an auditory prevention and education program; if the cares concerning the hearing loss are not taken, there will be a progression of such thresholds (Hanger, Barbosa-Branco, 2004 (6); Gatto, Lerman, Teixeira, Magni, Morata, 2005 (5)). As for Group II, composed by the workers with PAINPS suggestive hearing loss, 64 (16%) presented bilateral PAINPS suggestive hearing loss; 15 workers (3.75%) presented unilateral PAINPS suggestive hearing loss and 23 (5.75%) presented unilateral PAINPS suggestive hearing loss with incision in the opposite ear, which confirms the findings of Carcinelli (1988) (12) and Fiorini (1994) (13). 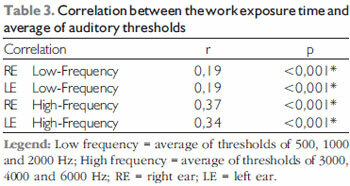 As for the frequencies that presented stronger affections to the auditory thresholds (Table 2), this work confirmed that the high-frequencies 3000, 4000 and 6000 Hz were the most committed, and there was no statistical difference between the ears, results similar to those by Ruggieri,Cattan Giardini, Oliveira, 1991 (7), Kos e Kos (1998) (9), Araújo (2002) (10), Corrêa Filho, Costa, Hoehne, Pérez, Nascimento, 2002 (8) e Hanger, Barbosa-Branco (2004) (6). The prevalence of complaints concerning the presence of tinnitus is described in the literature as a common complaint in workers that operate in occupational places with high levels of noise, in addition to associate such complaint to that of workers who present PAINPS (Dias, Cordeiro, Corrente, Gonçalves, 2006 (11); Araújo, 2002 (10)). In this study the prevalence of this complaint was low, only in 2.75% of the workers, and was not a significant datum. Before such finding, it was not possible to relate the presence of tinnitus to the PAINPS suggestive audiometries. The longer the exposure time the higher the affection of auditory thresholds obtained in workers exposed to occupational noise. The most affected frequency in this study was of 4KHz. 24.75% presented an audiogram confirming PAINPS, according to the classification, proposed by Fiorini. Therefore, an intensive work of hearing health promotion and/or hearing loss prevention must be emphasized mainly for workers exposed to high levels of occupational noise, as well as the correct use of individual auditory protection device. 8. Corrêa Filho HR, Costa LS, Hoehne EL, Pérez MG, Nascimento LCR, Moura EC. Perda auditiva induzida por ruído e hipertensão em condutores de ônibus. Rev Saúde Pública. 2002, 36(6): 693-701. 2. Specialist in Audiology. Clinical Phonoaudiologist. 4. Graduation in Phonoaudiology. Specialization in Audiology. 5. Master's Degree in Phonoaudiology. Fapesp's Scholarship Holder. Institution: Departamento de Fonoaudiologia, Faculdade de Odontologia de Bauru / Universidade de São Paulo Instituto de Audição e Comunicação - Alfa. Bauru / SP - Brazil. Article received on July 08, 2008. Approved on March 12, 2009.